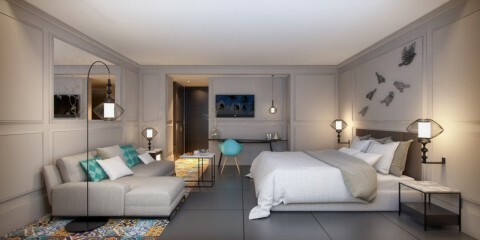 CHICAGO--(BUSINESS WIRE)-- Hyatt Place Goa/Candolim is the newest Hyatt-branded hotel to officially open in Goa, India. The hotel brings the Hyatt Place brand’s intuitive design, casual atmosphere and practical amenities to the Goa area. This is the fourth Hyatt Place hotel to open in India, joining Hyatt Place Hampi, Hyatt Place Pune/Hinjewadi and Hyatt Place Gurgaon/Udyog Vihar. Hyatt Place Goa/Candolim is ideally located in the heart of North Goa and is in close proximity to the state’s beaches, including Candolim Beach, Calangute Beach and Fort Aguada, as well as popular entertainment and nightlife destinations. Hyatt Place Goa/Candolim is less than 22 miles (36 kilometers) from Goa’s Dabolim Airport and 12 miles (21 kilometers) from Thivim Railway Station. Hyatt Place, a brand of Hyatt Hotels Corporation, offers more than 235 locations in the United States, Armenia, Chile, China, Costa Rica, Honduras, India, Mexico, Morocco, Panama, Puerto Rico, The Netherlands, and United Arab Emirates. For Hyatt Place information or to make a reservation, call 1-888-HYATT-HP (888-492-8847) or visit hyattplace.com.